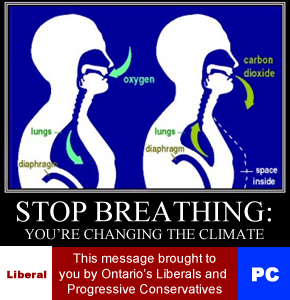 Last Tuesday, January 25, 2011, Freedom Party of Ontario released its latest plank for the October 6, 2011 Ontario provincial general election. Titled “Close Ontario’s Race-based Public Schools“, the plank promises that a Freedom government would close schools like the “Africentric Alternative School” that the Toronto District School Board voted, in 2008, to open…with neither Ontario’s governing Liberals nor the Progressive Conservative opposition doing anything to prevent the school from being opened. Freedom Party also released three pre-election video ads January 25, 2011 to promote the plank. That evening, I was interviewed by Ryan Doyle and Tarek Fatah on their popular Friendly Fire radio show (CFRB 1010 AM, Toronto, nightly at 7:00 PM). Clearly, the ads, and the plank, were provocative and popular. 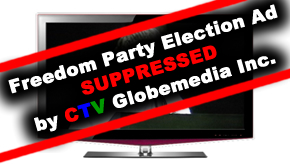 Within hours, CTV Globemedia Inc. suppressed distribution of the Freedom Party pre-election ads by alleging to YouTube that the ads infringed their copyright. CTV has provided no indication of what they believe constitutes an infringement. However, it is noteworthy that thousands of CTV news clips are available on YouTube channels, including on channels belonging to politicians in the larger parties (e.g., Michael Ignatieff and Bob Rae have CTV content on their channels)…yet CTV claims that it will not licence its news content to any political party…and numerous of its clips have been up on other politicians’ YouTube channels for years. 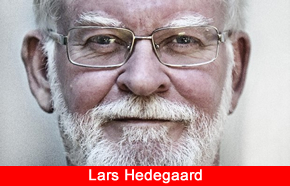 Suppressing the video on YouTube denied Freedom Party significant ability to have the video distribute virally, and to bring attention to the party. Many who had seen the video before CTV had it yanked are outraged. And, in fact, one of the world’s most noteworthy and influential free speech organizations – the International Free Press Society – has just released an official statement expressing concern over CTV’s suppression of Freedom Party’s ad. It is certainly worth a read. Stay tuned. Freedom Party is currently preparing its own response to CTV’s suppressive action. In the meantime, you can see what CTV was suppressing by viewing Freedom Party’s Close Ontario’s Race-based Public Schools plank, and scrolling to near the bottom of the page, where Freedom Party of Ontario has made it available for your consideration. Randy Hillier: his heart's in the Right place, but is he? 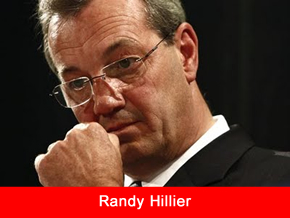 Over at the National Post’s blog, Progressive Conservative MPP Randy Hillier writes about his proposal to make a legislator’s pay increases contingent on increases in “the standard of living”. I agree with Hillier’s sentiment – that legislators should be more personally accountable for the harm they cause – but I disagree with his strategy (see a copy my critique of it – which I originally posted to the comments section of Hillier’s post – below). Such, it seems, is often the case: Hillier’s heart seems to be in the right place, but I disagree with his strategy.